Which Types of Insurance Are Total Rip-Offs? It seems like there’s a kind of insurance for everything nowadays. Beyond auto insurance, homeowner’s insurance or life insurance, you can get death-by-laughter insurance (for comedians), body-part insurance (for athletes or entertainers) and even kidnapping and ransom insurance (if you’re worried about that sort of thing). But since most of it feels like a racket — like that car insurance that jacks up your premiums even when someone else hits your car — how are you supposed to tell which kinds you actually need? So while still passionately hating the world of insurance but grudgingly accepting its necessity, let’s start by running down the types of insurance the law requires you to have. Health Insurance: The Affordable Care Act, referred to by some as Obamacare (you may have seen a story or two about it in the past eight years), requires all Americans to be signed up for health insurance. Right now, though, this is something of a legal gray area: Ever since Trump took office, the IRS hasn’t been rejecting tax returns where the health insurance information is left blank (known as “silent returns”). This is a roundabout way of saying that, for the moment, even though it’s technically legally required, there’s no real penalty for not having health insurance. That said, with the shocking cost of healthcare in the U.S., you would have to be insane to not have coverage of some kind. Plus, right now it’s illegal for insurers to deny coverage to people with preexisting conditions, but with healthcare reform very much in the balance in Congress, that may not last, so it’s a very good time to enroll while you still can. Auto Insurance: Every state in the union (except the inveterately libertarian New Hampshire) requires you to have auto liability insurance if you drive a car, which covers any damage you do to another driver or their car. Auto collision insurance (which covers damage to your own car) isn’t required by law, but if you’re making payments, nearly every bank or lender requires you to have it. Business Insurance: If you own a business with employees, you’re required to have a few different kinds of insurance: Workers’ compensation insurance (which covers wages and medical benefits to employees who are injured on the job, usually in exchange for their right to sue); unemployment insurance (which is paid into a statewide fund that goes to people who file for unemployment benefits); and depending on local laws, disability insurance (which covers employees for the long-term). Homeowner’s Insurance: While this isn’t legally required, unless you own your home free-and-clear, most lenders require a standard all-risk policy that covers fire, lightning, windstorms, hail, etc. While some people might steer you away from things like flood or earthquake insurance, Ferguson recommends them, depending on where you live (his own house suffered extensive flood damage last year). Dollar for dollar, he says, it’s one of the most important things you can buy: Just like health insurance, the cost if you’re caught unprepared is just too great not to do it. Renter’s Insurance: Again, not required, but it’s so cheap! For as little as $15–$20 a month, you can protect all your stuff in your apartment or house from fire, theft or other losses. Life Insurance: If you’re married, have children or other people who financially depend on you, life insurance is a good way to protect them if you die. Because unless you have savings in the bank, they’ll have to start to earn money immediately, and pay off any outstanding debts you may have had. And that’s pretty much it. Sure, there are other insurance types that might be pertinent to you, and which you should judge on their own merits, but for the average person, the above will generally see you through. Burial Insurance: Burial insurance is a bit similar to life insurance: It pays out when you die to cover funeral expenses. This is clearly unnecessary — and usually pays out far less — for anyone who already has life insurance (and by the way, decent life insurance policies often already provide burial insurance). Apart from that, though, it’s an insidious tool (often used to prey on the poor) because it can become a terrible investment: Live long enough, and the sum of all your payments will add up to far more than a burial policy’s typically modest coverage. Credit Life Insurance: Similar to burial insurance, this policy, which pays off your outstanding credit card balance in the event of your death, isn’t only redundant for those with life insurance (which, by the way, pays out way more), it can be a terrible investment if you live long enough. This is because, once again, your payments will add up to more than the policy covers. For example, If you’re paying $15 a month for a $3,000 policy but you live for another 17 years, you’ve paid more than the policy was worth. Auto Medical Insurance: This is by no means a scam, but Ferguson brings it up to highlight its redundancy: It’s unnecessary for those with health insurance, and those who often drive with people who also have health insurance. It’ll cover your medical expenses or those of people in the car with you (unlike auto insurance), but if you already have health insurance there’s no need for it. Travel Insurance: Okay, hang on: Yes, travel insurance is popular and widely offered; and yes, it provides useful, practical coverage. But again, depending on what you already have, you may not need it: Travel insurance is usually some combination of trip cancellation coverage; baggage coverage; emergency medical coverage; and death or dismemberment coverage. Around 15 percent of credit card benefits include trip cancellation, while health insurance and life insurance can cover medical costs and dying, respectively. So once again, you may be paying for something you’re already covered for by your other policies. 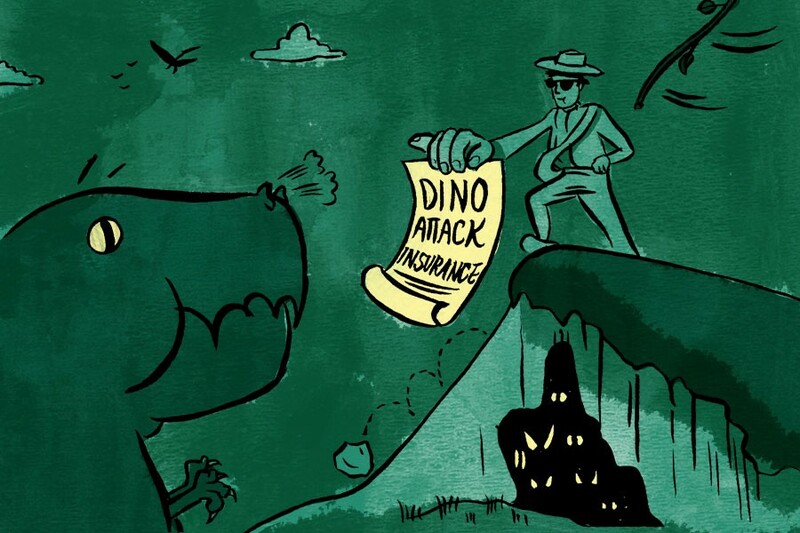 In the long run, like most grown-up things, it boils down to the boring stuff: Reading the fine print and knowing exactly what all your insurance covers — and doesn’t cover — is the best policy (no, pun not intended). Just think about what you need, and you’ll be able to disregard all the sales pitches for the stuff you don’t.